Binary operators can be overloaded in a similar manner as unary operators. It receives only one class type argument explicitly, in case of a member function. For a friend function, two class types are received as arguments. It returns a class type. The above expression contains three objects namely A, B and C of which A and B are the operands while C is the one to which the sum of A and B is assigned to. In the above expression, the operator function is supposed to add two user defined data types and return a user defined data type. In the above expression x is the data member of the object that is invoking the operator member function, while rhs.x refers to the data member of the object passed as an argument to the function. Since the function operator + ( ) needs to return the result, we need to have a temp variable (of the same class type) that stores the value to be returned. 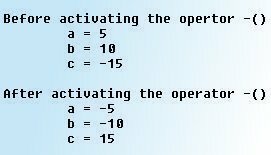 It should be noted here that in overloading binary operators the object to the left of the operator is used to invoke the operator function while the operand to the right of the operator is always passed as an argument to the function. At this point you must be wondering how we can eliminate a temporary variable and use this statement instead. Well, this statement causes the appropriate constructor to be invoked, and thus initializes an object with no name which stores the result of the addition. This nameless object is then returned by the function. Using temporary objects in this way can make code shorter, more efficient and easier to read. 170 queries in 0.480 seconds.